Anfield Index > LFC Statistical Comparisons > What Liverpool FC need (Part I) - The Left Back. What Liverpool FC need (Part I) - The Left Back. We could sit here all day, and debate what areas of our current squad needs strengthening. We could also discuss potential targets, and how realistic a chance of a certain team accepting a bid, and a certain player joining. The format will be simple. I will analyse who we currently have, and why it does need strengthening. And then, I will look at options in the Premier League who could potentially step up. Now, these are not players I have selected. Also, these may not be the players that we sign. However, we have been strongly linked with all 4 “options” and there is no secret of our interest. We may sign them, we may not. I am certainly not saying we will. Also, of the “Current Squad Options”, I will only include players who have the position as their position (or played consistently in that role). Players like Wilson and Carragher wont be included at left back, for example. Anyway, the boring stuff out the way, lets start at the back, with a position we have been longing for a quality option, who is consistent. But not only in form, but in fitness too. Fabio, Fabio, Fabio. Where for art thou Fabio? That is what it feels like at times, which is such a huge shame. This season, he has managed just 6 Premier League starts. In his first full 4 seasons, he averaged less than half a season in appearances (17.8 games a season). In his best season (as it was for many in 08/09), we saw the “real” Fabio Aurelio. He was solid at the back, had a great delivery from set plays, and just felt like he became someone you could “rely” on. But even in that season, he featured in less than 2/3rds of Premier League games (24 appearances). In 09/10, he lost his place to Insua, and never got it back (more on this later). But this wasn’t a slant on the ability of Fabio himself as a player, but again, just too injury prone. Now, you don’t need to know these statistics to know that is his short coming unfortunately. And that is the problem. Fabio (when he first arrived) didn’t look all that, but he was in and out of the side with injuries. However, when he finally got a solid run in the side in 08/09, his class and quality shone through. If we look at a few selected games, two at random, one chosen for a reason, and lets see what Fabio gave us? Amazing how similar these chalkboards are, and these were taken at different stages in the season. The two selected at random, we see 2 assists. This proves as an attacking full back, he really can deliver a great ball. Across the 3 games, his pass completion was very good as you would expect (77%). That also includes one or two “long ball” attempts which often didn’t come off. His short passing game, was near spot on. The game that wasn’t selected at random, I am sure you can guess, was the one against Manchester United. Now, I didn’t include it because of his outstanding free kick (which I am sure we never tire of seeing), but because I remember vividly, he put in a fine defensive display. He won 3/3 tackles, he won 5/7 possession duels (71%), he intercepted the ball, and he never committed one foul. And who was he up against? Christiano Ronaldo, in the main, who bar his penalty, didn’t influence the game too much. But look at the Chalkboard below (embedded, so you can see yourself). Most of Ronaldo’s passes came down the right in the first half (against Aurelio). However, he was getting very little joy. Look at the right hand side, and how many times he got beyond Aurelio in the first half? Not many, is it. Where as when he switched to the left, Ronaldo got a bit more out of the game (although his crossing was wayward). An Interactive chalkboard, to show Ronaldo and his passing/crossing. Hover over the dots, to see the time of the “events”, and you will see Ronaldo played down the right in the first half. What this shows, that Fabio at his best, is very, very good. He is consistent, but his fitness isn’t. And that is a huge shame. Also, at 31, he isn’t going to get any “better”. However, to his credit, I firmly believe Aurelio can be seen as a good blue-print, for the type of left back we need. If we could find someone with a left foot delivery as good as his, can get stuck in and tackle, can shackle one of the worlds best players, and can do that week in week out, and stay fit? We will be sorted, that is for sure. On loan at Galatasary, where he is struggling to get a game. But what went wrong for someone who looked so promising? As I touched on earlier, I think Fabio and his injuries didn’t help. Insua started the season well in 09/10, and shared the role with Aurelio, as they were rotated (due to injuries in other areas), to try and freshern things up. This unfortunately stopped, when Aurelio picked up another injury. Insua carried the left back role on his own, and to his credit, he did well to begin with. But then, one or two bad games, and his confidence dropped. The fans got on his back, and he needed to be taken out of the team, as he was suffering. Unfortunately, this couldn’t happen. Fabio was still injured, and we had no other left back. This left him struggling through his bad form, and things just seemed to go from bad to worse. The above compares Insua at Home against Hull City, and against Manchester United Away, later on in the season. Now, home and away is a different proposition. Hull City and Manchester United are a different propsition too. And well, the results were very different. But look at the V Hull City chalkboard first off. Clearly Insua can get forward (when allowed to), he can create goals, he can cross the ball. And, while not a direct assist, he was involved in the opener, exchanging with Dirk Kuyt, and setting up Riera, who delivered the ball to Torres to score. On the defensive side (what little Liverpool had to do), the whole game, he was not dribbled past. He won 66% of his possesion duels, 100% of his tackles, and also intercepted a pass. This was the story of the early Insua. Later through the season though, and against United, defensive errors were creeping in. He still got forward (as much as he could), but his defensive game seemed to go down a slipperty slope. Harsh to pick the United game (arguably the toughest away game we have all season), but, it highlights my point well. He only had 1 tackle (which to be fair, he won). He only won 17% of his possesion duels (1/6). He was taken on twice. And the cross from the second goal, came down his side. Now these two games (after scanning over a few) best demonstrates how Insua needed to be taken out of the side, but couldn’t. These were not the only two examples though, but i’d be here all day if I looked at them all. Insua in the summer just gone, was seen to be surplus to requirements, and loaned out. He has not had much success at Galatasary, so maybe the player we once saw, isn’t there anymore. I would welcome him back, as he still is only 22, and can certainly be a good option in our squad. However, I don’t think he is the long term answer. This season we have had many players play at left back. Agger, Wilson, Carragher, Aurelio, Konchesky, and Johnson. Aurelio, we know, has his injury problems. Carragher and Agger are far better in the centre. Wilson is young, and like Carragher, you feel he would be better in the middle. Konchesky is on loan in the Championship. And finally, Johnson, who is the only one who has looked pretty solid (consistently). But Johnson is not a left back. He is a right back. And that is where he should play, and battle it out with Kelly for the starting birth in the team. The rest are not good enough, not fit enough, or needed elsewhere. Gael Clichy made his league debut aged 18 (in November 2003). He played an understudy role to Ashley Cole for 3 seasons, and impressed when Cole was unavailable or injured. When Cole was sold, Clichy became the first choice left back, at the age of 21. Ashley Cole himself also broke into the Arsenal side young. His league debut, he was aged 19. Prior to his league debut, he had spent much of the season on loan at Palace. He played understudy, to the the then first choice, Sylvinho. It wasn’t until he got an injury, that Cole took his chance. He became the established first choice (Playing 29 games) in 01/02 (age 20/21). So you can see a pattern here. Robinson has had rave reviews in the youth and reserve teams, and impressed against Arsenal, but lets not get carried away. He is very young, and still very early in his development. We still need another left back, so that the likes of Robinson (and same applies for all youth players) can learn their trade, and take their chance when given it. Jose Enrique, is he the answer? Firstly, as I will with future players, I will look at the game against us first off as a reference. If the player doesn’t play, then I will look at a randomly selected one. I may also use additional games to help demonstrate a point if needs be. You may, or may not, chose to believe rumours, but we have been strongly linked with the Newcastle man. He has had some excellent reviews this season, and is regarded as a a very talented full back. I will look at a few of his games for Newcastle, and see if he could be our “fit” Fabio Aurelio. The all important stat first off, is that he has featured in 30/32 Premier League games for Newcastle United this season, and all have been from the start. I am not sure which games he didn’t play in (if he was injured or not) so I can’t say. But 30/32 is an excellent return, and shows he consistently available. So, he ticks that box. However, can he be as good as Aurelio is? Can he defend like him, and get forward like him? Lets see. It is worthwhile noting that Newcastle have had two different managers this season, which no doubt means, two different playing styles. In January, they also lost their focal point (who is now with us, Carroll). Also, while Newcastle have had a good first season back in the Premiership, they are not a top 4 side (where we want to be). The reason I say this, is because to be at the top, your full backs need to defend differently. What I mean is, more often than not, the best sides are constantly on the attack. The lower sides are constantly defending. So, to play in a top side, you need to be able to make sure you are switched on, and ready to defend when needed. And, when you make your tackles, and possesion duels, you win them. From an attacking sense first off, I notice there is there is a lot more red. Red being, an unsuccesful pass. In fact, his pass completion percentage was relatively poor (compared with Aurelio). Just 67%. But look a little deeper, and you will find the answer. Clearly Newcastle, go for the long ball early (or they did with Carroll). Of his 23 passes that didn’t find a Newcastle target, only a a few were over a short distance. Also, to his credit, he did find a team mate with some of his long passes too. This to me says that Enrique can do a role within our side. Just because we have Carroll, doesn’t mean we will go for the launch up to him every time. Enrique’s short passing game was almost spot on, and he rarely gave the ball away in his own half. All attributes that our new left back, will need. Finally, in an attacking sense anyway, that little white dot. That is an assist, for those that don’t know. Now, wind back to the game, and just remember the goal. Yes, it was Andy Carroll in the 92nd minute. But think about the context of that moment. At the time, Newcastle were 2-1 up. We were pressing and pushing for an equaliser. In the 92nd minute, Enrique was one of the furthest players forward, and contributed to the goal that sealed the win. (Another interactive chalkboard below, will demonstrate what I mean). So, Barton wins the ball back and plays it to Carroll. Carroll turns, and starts to run forward on the counter attack. He looks up, and who is bombing down the left side? Enrique. He plays a 1-2 with him, and Carroll smashes it in from 30+ yards. That is the kind of full back attack we need. And judging from the above, I think Enrique can offer us the attacking presence that we need this season. Enrique has 2 direct assists this season, which isn’t a lot, but I bet he is involved in a lot of attacking moves (at some point) that would lead to goals. So what about his defending? Well, he won 2/2 on his tackles. Can’t grumble at that really. However, his possesion duels were not so succesful. 4/11 is just 36%. You need this to be at 50%+ ideally. Although, to his credit, he cleared a chance off the line, so I will give him a bit of kudos for that. So, against us anyway, his defending looks OK (in stats) but could be better. Lets give him a second chance. Using a random selection, I came up with the amazing Newcastle 4 – Arsenal 4 match. Maybe not the best to demonstrate (as it was a crazy game), but lets go with it anyway. He won, again 2/2 of his tackles. His possession duels were up, winning 8/14 this time (58%). No heroic defensive off the line clearanes this time, however, there is one interesting statistic for you. Against Arsenal, who were outstanding in that first half, he wasn’t dribbled past once. Which to me says, he was doing his job well, and despite his side conceding 4 goals, he had no defensive errors attributed to him. Now, without accumulative stats (which are coming soon) it is tough to say if these stats run right through. I very much doubt he wins every tackle goes in for (as he has done in these two examples), and I would be fairly confident that this possession duels %age will be around the mid 50’s. When accumulative stats are up, I will certainly re-visit this post. We have seen that he can get forward and make things happen. And when up against one of the best attacking forces in the Premiership, he can defend too. He was at fault for the Arsenal third goal (maybe a bit harsh), where Arsenal burst into the box, and he tried to stand up the attacker (not sure who). But the ball was cut back behind him, and Arsenal scored their third. But this is highlighting one moment, in what was a defensive nightmare. Other than that, he was pretty solid. So the question is, can he do it for us? To summarise Enrique, I’d say yes. There is no guarantee he would be a success here, and a hefty price tag is being quoted by certain parts of the media. However, he has demonstrated he could become our “fit” Aurelio. He will have to change his game slightly, which I am sure he can cope with. And to be fair, this is more likely an instruction from the manager to “look long early”. He is 25, and would have his best years ahead of him. He has yet to receive any full international recognition, but considering he spent last season in the Championship, that isn’t surprising. Spain are World Champions, Europen Champions, and have a plethora of talent to select from. Maybe if he can get himself in to a top side, and into the Champions League, then international recognition may follow. I started by saying we need a left back. That much is obvious. I have demonstrated the options we have in the squad, are not sufficient, that is pretty obvious. I think Enrique has the tools to be our new left back, however, he may not be. We have been linked with others too, such as Baines, Fabio Coentrao, and Taiwo. They wont be the last ones we are linked with either. Lets just hope we get it right, whoever we sign. I am confident that we will. This is Part 1 of 4. I will try to release each part over the coming week. The next post will concenctrate on our potential need for a new central defender. A really good, in depth article focussing on the issues we have at left back. Really enjoyed the read. 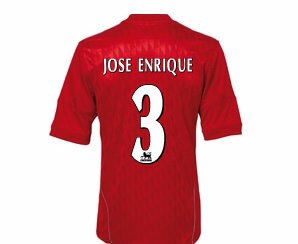 I’m not sure that Enrique is the answer but he’d be better than a right back playing at left back. I’m really looking forward to the next part in this series!! Categories: LFC Statistical Comparisons and Liverpool FC Player Profiles.' 'Tags: Agger, Carragher, Glen Johnson, Insua, Jamie Carragher, Jose Enrique, Konchesky, LFC, Liverpool, Liverpool FC, Liverpool FC Stats and Liverpool FC Transfers.